Lemonade Makin' Mama: Half Pints Giveaway... etc. So sorry your husband did not get the job. I pray for a sense of peace for you all. I love the party invites! Sorry to hear about the sad news! I hear you, so ckearly. Wanting to move and do what you want to do and yet having God close door after door is so hard. It's frusturating. It's confusing. You think you heard His voice so clearly, saw the sense in what you thought He was doing. Then, the answer is simply "Nope. Not right now." I will be praying for you more! Trivial as it may seem compared to all that those on the East Coast ( and even in other places of the world) are facing....This is our struggle. This is the cross, the confusion God has given us. This is how we become more like Jesus. Personally, I'm disappointed that you won't be Ohio bound but I know God has an incredible plan for your family. Keep on holding on. :) This is a great giveaway. I would love to have really beautiful Christmas cards instead of no cards which is usually what happens every December. PS-- I love the Deck the Halls Christmas card! I'm so sorry about the job. I prayed for y'all and this job but it wasn't meant to be. Keep your chin up- it will all be okay. And I second what Victoria said- this is your struggle. We all have our own struggles. I love the "True Love Was Born In A Stable" print! I'm lifting prayers up for your family! I love the Jesus and Germs are everywhere print! Amber's shop is adorable! My absolute favourite print is the Jerimiah 29:11 print....that verse is meant for me! Goes very much in line with what I just shared about being patient in my own life! I'm so sorry. My husband and I have been there. It is so hard. Praying for you. 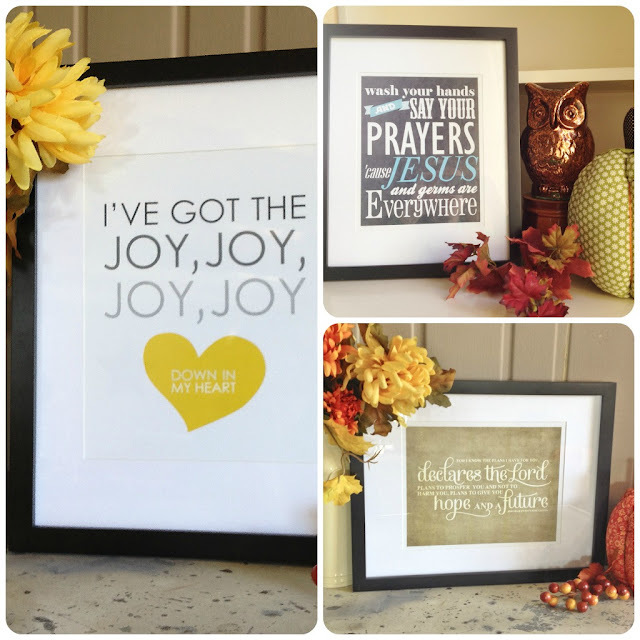 I really like the joy print or the Jeremiah 29:11 print. But Christmas cards sound great also. Everything is so cute. I can assure you that this trial will not go unused for His glory. The learning gleaned from the biggest 'whys' in my life have turned out to be the best learning experiences and they also allowed me to trust deeper and grasp faith a litter harder. Amber's shop is SO delightful! My favorite is the Jeremiah 29:11 - Hope and a Future Print. However, the Jesus and germs prints is sooo funny. I may have to get that for the kiddo's bathroom. So clever! P.S. Hang in there...your strength and confidence in the Lord and His plan will not let you down. Pinky promise! wish i was there to take you to lunch...maybe anthony's. we could pig out on creme brulee...and none of it would even matter. not a bit;) love you friend. oh and i love that joy joy joy...down in my heart print. sweet sweet! Keep Calm our God is Greater!! I am love with that! I am going to buy it! =) There are so many "keep calm" trends right now...but I've never found one that was true in my heart...but this one is it. Our God is Greater...fits every situation big and small. LOVE IT!!!!! I'm so sorry Hon... You don't know how many times I started a note to you, and then thought WAIT... she'll tell us when she's ready. Praying that God will reveal the "whys?" when it's time & that they will confirm the reason for the "no's" in your mind. You are so faithful to the Lord, and he sees that & is working it all for his ultimate good. I love all 3 of the posters you featured! I also love the "Keep Calm, Our God is Greater" print. :) Thank you for this giveaway! Hang in there....I know the waiting seasons of life are the hardest. I think God has got a sweet sweet plan for your little family. I can't wait to see it unfold. Thanks again for the sweet feature...I'm so excited to see who wins the giveaway! My favorite is the print "True love was born in a stable." Just may need that, and the keep calm, God is greater print. More importantly, I'm so sorry for this aching disappointment. I know you know every encouraging word I want to say, and I'm not going to say. I just am praying for you, your family, and that you will find, peace, joy, laughter and a better day tomorrow. I totally get what you are saying. we bought our house seven years ago before the housing market crashed and now we are underwater. long story short, we love vacationing in New Hampshire and for the longest time, I thought moving there would solve all of our problems because life is so simple and it is beautiful there. well, we are still in our house in MA and still struggling. I was a teacher in a public school and when Ava and Caroline were born, I left to stay home for two years. now I am back working in a Christian school making half of what I did. somehow, I know God has put us where HE wants us to be! On alighter note, I love her shop! the Christmas cards are super cute and I love the print "I've got JOY, JOY, JOY down in my heart" and the "Keep Calm" print! Sasha~ I a sorry to hear that all the energy , hopes and dreams you placed toward letting this possibility be the right one for your family didn't turn out the way you had hoped. I have found out the hard way that experiences like this seem to give us more strength than they actually take from us. Of course sometimes we are sure we need a little change more than we think we need any more strength. I think that it is beyond difficult to embrace the whole "Let go and let God" thing, but hey, He knows us better than we know ourselves. And He wants the best for us. And He always has our backs. Always. I hope that you and Adrain find peace with this very soon. Be good to yourself and each other. Together you have all that you need. Oh~ and I love Amber's work. especially loving the Holiday cards, Thanks for sharing! boy do i know that feeling of "why?" & "how long, o Lord?" ... i know what it means to cry through every "no", to keep praying the same prayers, to doubt & have faith all at the same time, to praise Him through the tears. i finally got my "yes" this past august, after a looooong season of loss & lostness. it will come. and when it does, i pray for you the same thing i prayed during my season of "no" that He faithfully answered when the "yes" came -- if You're going to put them through this, Lord, make sure there is such undeniable glory for You & undeniable crazy good for them that comes out of it all. it is the promise You make in Your word to all who love you. and they LOVE YOU. and we trust You to be faithful to Your promise. I love the gray chevron address labels! We have also been through a rough path...the loss of a few close family members, a layoff, trying to find a job, taking whatever he could, a 2 1/2 hour weekly commute to a new job, pay cut, many resume's sent, sickness, all over the last few years. I totally understand where you are coming from. But, God is Good and He will lead us to where we are meant to be. Praying He leads my man home very soon! A year and a half is too long to only see each other on weekends. The best thing of all is through the hard times we have become much closer to each other and to the One who is seeing us though. I would have to say my favorite is the "Hope and a Future" print...so fitting!! God Bless all on the East Coast who were in the path of this terrible storm. Aw girl I'm sorry. It's hard to have faith sometimes. God sees the big picture though. Please know that I am praying for you and your family. I understand completely the feeling of wishing I had told no one, feeling like a flake, my pride tells me to keep my mouth shut, God tells me it's about him being glorified through my trial. I have that day today, my hubs is off to the "final" meeting.I used to feel confident but then the one we thought we had in the bag yesterday "never called", what could this mean? What if he doesn't get this one either? Ugh, it's so hard. My heart is with you. I know what it's like to ache for change, to make the mental move, see the new house, new life, new future and so I won't reaffirm you with everything I should say because I know you already know it. It's ok to mourn and be sad, nothing more or less, it's simply OK. I love Amber's shop! I think my fave is the keep calm, our God is greater. Sending prayers and a hug. I know disappointment and it hurts - big! Your faith is inspiring - keep believing good things do happen just not always on our time schedule. My heart breaks for you and your family Sasha. Unfortunately I know your pain and disappointment all to well. My husband did not get the job that seemed to land so perfectly in his lap either...Again. At this point in my life I am seriously questioning my faith. Everything seems to be falling apart faster than we can pull it all together sometimes. Ya know? Anyway...hugs! Things can only move up, right? Praying for you and your family Sasha! Thanks for the introduction to Amber's shop! I love it! I LOVE the Jeremiah 29:11 print. Such comforting words for these days! It never feels like a season when you're in the deep midst of it. I appreciate your candidness, and am blessed by the testimony of God's glory in your lives. It would be nice if we got to enjoy all the parts of our lives, but how wonderful to know He has something truly perfect to look forward to one day! So sorry about OH will all work out and will be better then you've expected, hang in there. The joy print so reminds me of my two nieces they are always singing it, oh and they live in OH. Oh I am so sorry you are going through this! I have been in this place too. I know that "God has a plan" is a lot of blah, blah, blah, at this point. :) But you will be SINGING about it in the future! I just know it!! I'm so sorry. Someone once told me "Our disappointments are God's appointments". I know that He has something wonderful planned for your sweet family. I'll be praying for y'all. I love the I've Got the Joy, Joy, Joy print. I sing that song with my kids at school all the time. I am about to do announcements for my newborn and I really like her pink damask ones! girl. i am so sorry. it is absolutely hard when your man has to do a job that he doesn't enjoy. kelly was there for 4 years and it weighed us down. praying, praying for relief for him and you. 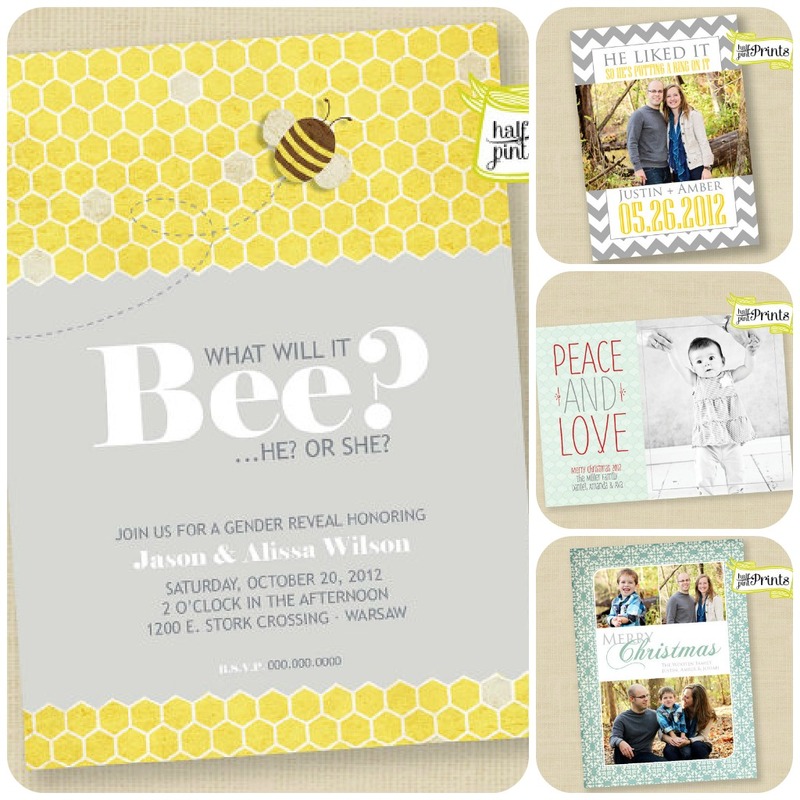 what lovely prints and invites! my fave is the jer 29:11 - i have always found comfort in that verse. I am sorry about your disappointment, too. It is hard to be in a place that doesn't feel quite right. I feel that way also, and sometimes I tell myself maybe that's how it should be, because if I loved it where I was then I wouldn't long for something else. That something else, I think, should be Heaven, and not too long ago I was reading Calvin and he put it along the lines of we ought to be grateful for where we are/what we have, but always be longing for what is to come. For me, my personality, I think that if I were in a place that brought me a lot of contentment, I would forget about God. I don't know if that makes sense...it makes sense in my head! :) At any rate, may grace find you every day, and may redemption be before you each moment. Redemption is my favorite...He takes all things and makes them his own. Starting with us...how awesome. I need that reminder more than anyone! :) Peace and grace and joy...all of these things he has promised us, even though they may come in unexpected ways. Love your blog, and thank you for sharing your journey. Hopefully it's healing for you. I am sorry the job didn't work out! I love reading your blog! I also checked out half pint prints...thanks for the drawing entry! I'm soory Sasha for therough spots in your journey, and admire your attitude about it. Praise and thanks helps to cure whatever ails you. That's my lesson and I'm learning it. I have had those same feelings for years and now it seams that life may pass by and this what we have and where we are IS it. So many things I dreamed of doing are not going to happen ever BUT GOD who does have a plan and he is also faithful to reveal it to me. As I let go I can hear more too. I wish I would have been where you are at your age. Keep praising and thanking, that is faith. We can't focus on the circumstances we look up and focus on our Father and how MUCH HE LOVES US!!! hugs. If I happen to get picked I'd like some cards, vera cute. I love the Joy Joy Joy Down in My Heart. So appropriate in your situation and in all of our lives- there's still the joy of Jesus. Definately cute prints ! Sorry the move did not work out. I promise God does gave a better plan. He knows what is best. Wish we could have been neighbors...but never say never. Another (even better) opportunity may be just on the horizon. Chin up and smiles! All my best to you and your family. Know that you are not alone. We have the same issues of long commute, less money, more work. Doors keep closing and nothing seems to open not even a window crack. But we trust, especially as we are facing a possible cancer reoccurence. Life is hard and God did promise that. Praying that He will reveal HImself to you and give you peace. Very cute prints and cards, love the Jeremiah 29:11. Blessings on you. I'm so sorry for your disappointing news. I pray for His peace, which we can't understand, to guard your heart and mind in Christ. He does have a plan. I can so relate to your situation... we were in (what I felt like was) limbo for several years after the closing of our church, but I know that it was all in the Lord's plan. And even our current situation could be considered less than ideal, yet I must still rest in the Lord. Thanks for your honesty in the midst of your struggle. I am so sorry! That has to be so tough. I love how you are working on turning it into a good thing. You are very inspirational to me. I love your blog!! My 8 yr old Jeremy even likes to try to read some of your posts and he has trouble reading so he is getting encouraged by what you write...added bonus! Love the Jesus and Germs print. I've seen that quote before and decided that when we're finished with our son's bathroom, I'm putting it in there. Her Christmas cards are very nice too! By the way, I pinned the Jesus and Germs print!!! I'm encouraged by your faithfulness, Sasha. You will be blessed. And when that day comes, give God all the glory! I have to say the joy joy joy one! Love the Isaiah verse.......gotten me through alot over my life...God is faithful and such a loving Daddy! i am sorry that you are sad that ohio is not calling you right now. that is because it is not the 'right' time, or that god truly does have something bigger and better in store for you. there is always a reason for why things work out as they do. sometimes, it makes us angry, and we pout and cry and act like big old babies, but bottom line is that when the timing and place is right, you will be placed exactly THERE! i love your positivity and love reading your inspirational quotes. you are an inspiration to so many of us. blessings to you and your family and 'the right place and time' :) xo oh, and p.s. my favorite item would be any of the christmas or note cards! they are ALL adorable!!! Goodness there are so many great items! I love the Joy one you posted, because my little guy sings that in chapel, but Jeremiah 29:11 really resonates with me because we send it at the end of church each week. It'd be a great daily reminder up in our house as well. The Christmas cards are beautiful too!! I love the Joy one with the dots! I pinned Jeremiah 29:11 as well. Such cute prints and cards. I love the Jeremiah 29:11 print, it would look great on my wall. I LOVE the Merry Merry Merry Christmas card!! I'm a long time reader (stalker) :-) first time commenter! I had to say- I know exactly where you stand. We are a military family- which basically means complete uncertainty, and I don't deal well with uncertainty! Over the past 7 years its been- hubs is deploying, no he's not, we are moving, no we're not, etc. Our friends, I think, think we're crazy. But God always has a plan! We're at that point again- not knowing where we'll be in 6 months, and I'm debating telling anyone. You are a blessing to me! Thank you for being honest and vulnerable! I love the Jeremiah 29:11 print! Gosh. Sigh. You have already prayed this, I'm sure, but I'll pray for you also that God just BLOWS YOUR MIND when he surprises you with His perfect plan. I love the Jesus and germs are everywhere print. I love the Peace Love and Joy Christmas card. Her designs are awesome! I love the "wash your hands" print...so cute! I love the Jeremiah 29:11 one, that is one of my favorite verses! Disappointment is so hard. Especially when you have surrendered and think God is opening a door. Thanks for sharing. I'm so sorry. On a happier note, I received my Christmas garland. I LOVE IT! I love all of the prints and paper you featured on this post, but the "Jesus and germs" one is awesome! So sorry about the sadness of not moving, again. Whenever it does come though, it's going to feel so good and so right. Hang in there girlie. What a sweet giveaway to cheer you/us up! I would totally dig some chevron birth announcements for this wee little babe! Hugs! I love all of the art work and the Christmas cards are Delish! Beautiful talent! I especially love the picture with Jeremiah 29:11. Praying for you LMM. My thoughts go out to you girl. We just moved out of state we had a chance to have a fresh start and a job with the same company my husband has been working for we've been out hear for 3 weeks and his job doesn't have anything lined up for him. We love our new house and new town couldn't be happier but his job not panning thru is worrying us to death I have been praying and praying this turns around. I hope you husbands job situation turns around for you soon. Any and every Christmas card?!! Beautiful work!! I love the "Joy, Joy, Joy, Joy Down In the Middle..." All of Half Pint is great! Your faith is truly inspiring, Sasha. Your faith and God's love will see you through whatever comes ~ I know that for sure! I personally would like the Jeremiah 29:11 print ~ one of my favorite scriptures! Love the print which says" wash your hands and say your prayers!" Would put it in a spot in our guest bathroom that my twin grandsons use about every day! So fun!! I really like the joy, joy, joy print and the Jesus and germs are everywhere print. Sasha, ever since I read about your disappointing news I have been thinking of and praying for each of you. May the HOLY SPIRIT minister hope, assurance, peace, and revelation to you. I am praying and believing the LORD will provide the perfect job for Adriane; one where he will be blessed and in turn be a blessing, where his gifts and talents will be maximized and blessed as he helps build the Kingdom of GOD here on earth. Love you sister! So sorry to hear that the answer was "no". It seems like we are always hearing no, too! So hard to know what to do next... I long for peace and contentment. I love the "I know the plans I have for you..." print. Seems so fitting. I LOVE the joy, joy joy print but I love the Christmas cards too....tough choice!! !